The shorthand description of a learning management system is an online location that helps you manage administration, tracking, reporting and delivering of courses, lessons and tests. How does a learning management system work? The best way to imagine a learning management system is to think of it as a vast website, that only those people with a log-in will be able to access. Within this ‘gated’ website you can provide interaction with your students in two modes: online or blended. Online learning is similar to distance education provided by organisations like the Open University where students are based off campus and interact with tutors and other learners asynchronously. Blended learning is where teachers and students meet physically, but the LMS is used to support learning by providing a space where materials can be stored and organised, assessments can be given, and students and teachers can interact using blogs, forums, and so on. As the primary role of a learning management system is to deliver learning to students, typically, there will be three different types of log-in (there could be more, depending on your solution). These would usually be an admin log-in, a teacher log-in, and a student log-in. The admin log-in will be for administrators; when logged in, it will present the user with the tools to be able to add content and users, remove content and users, and allow users access to certain areas of the learning management system so that they can change settings. The teacher log-in will allow teachers to assign work, receive completed work and results from students, and also create courses (see below). The student log-in will present the user with information regarding courses, outstanding work and links to resources. It will usually provide a way of contacting the teacher or course leader if they have any questions. Work can be submitted from the student log-in – which will then be picked up by the teacher or course leader from the admin log-in. What are the typical features of a learning management system? Most learning management systems are built bespoke to the organization’s needs, however they do generally share the same basic features. An internal messaging system, as mentioned above, is usually a standard feature on all learning management systems. Before the age of the learning management system, many schools, colleges and universities had internal email; the LMS can help make that a thing of the past. Having a learning management system means messaging – and everything relating to learning – is all in one place, so it’s safer, with no interaction with those outside of the educational establishment. Other typical features of an LMS include course creation and management, self marking quizzes and tests, student data and the ability to mark work (or self mark: some learning management systems can mark work that’s been submitted for you). Course creation is the most fundamental part of your learning management system. Creating courses is how you set work for your students, and depending on the functionality of your learning management system, will allow you to make learning much more fun. The content of what you want to teach is added to a course. Many solutions will give you the ability to allow students to give answers directly within the course – and, depending on the nature of the questions, self-marking tests are easily embedded within the course. Student data is another core part of learning management systems. Having all student data within your solution means students can be easily contacted and set work for- particularly if they are arranged into their respective classes. Many educational establishments integrate their learning management system with their MIS system, for example Capita SIMS, so that any student data that is changed on their system is automatically updated within their LMS, and vice versa. What are the benefits of a learning management system? Firstly, it streamlines the education process. Marking work is easier and quicker, especially with self-marking quizzes and tests. Plus, as we’ve mentioned above, messages, work setting and submission, and results are now all in one place. Technology has the potential to engage and motivate learners more than ever before – and with an intuitive learning management system, you could see interaction and subsequently results improve. In particular, features that motivate learners – such as the Mozilla Open Badges system that can be used in Moodle – incentivise achievement and can make learning fun. You can also track activity on your learning management system, from how many times a particular student has logged in, to who has completed the work you have set. This ability to track and record data also means things like test results are automatically collated and stored in one location – so they’re easier for you to access and review. Learning management systems can be accessed from anywhere, which, coupled with their ability to engage and motivate learners more, means students aren’t restricted by lack of tools to do their work, or being able to complete work without any help from tutors. Being able to message their tutor for help or with questions means less dependency on having to see them face to face. Queries can be answered in real-time. It means learning management systems actually encourage interaction between learners and educators – something that can only benefit both parties and lead to more engaged pupils, a better quality of education, and higher results. There are many aspects to consider when looking at how to choose the best LMS for your company needs. To help you get through the complex decision-making process, we’ve listed some of the most important things that you should look at when choosing an LMS. It’s impossible to choose the right LMS if you are not fully clear about what your organization’s short- and long-term learning goals are. Once you have determined these goals and a clear organization-wide learning strategy has been developed, you can start looking for an LMS that will help you achieve your goals. Your learning and development team will have to work with your new LMS day in and day out, so make sure that you involve them in the selection process. Ask them about their needs and goals. If they are very technical, they may want an LMS that allows them a lot of flexibility in customising courses and learning portals. If they are non-technical, a simple user interface and good documentation will be important aspects to look for in the new LMS. The implementation of a new LMS can become a massive failure if your employees hate using it. Talk to your employees about their learning and development needs. Let them try demos of the platforms you are considering and take surveys about what they liked and disliked about them. A user-friendly LMS that helps create an enjoyable learning experience is crucial for the success of your learning strategy. A new LMS vendor may offer a range of unique functionalities that sound very exciting, but if they have no experience in your industry and/or do not have any clients that are a similar size to your organization, you may want to steer clear for now. Practical experience in setting up an LMS at a similarly sized organization in your industry can be invaluable when encountering specific issues. You should also do some research about how satisfied past clients of the vendor are. You can search for reviews of the proposed learning platform online or ask the vendor cor customer case studies and testimonials. You will need ample support during and after your LMS implementation, especially if you are rolling out a new LMS in a large organization. Research the support that is included and additional support options that the LMS vendor provides and how much they cost. 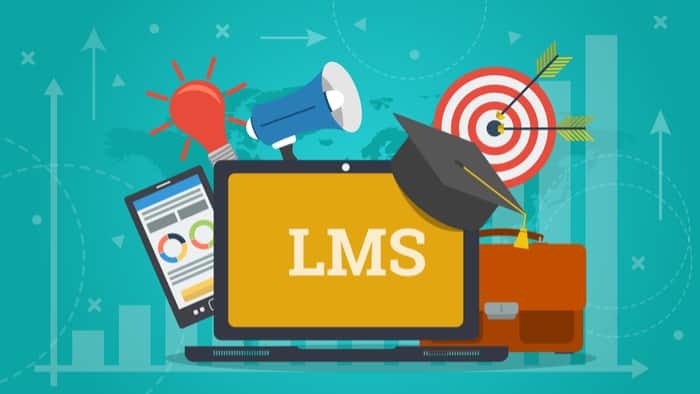 You may think that you have identified the best LMS provider and the perfect learning management system based on your checklist. However, what about if you’re not satisfied 1 year, 3 years or more down the line? A proprietary LMS means that you are buying into both the provider AND the learning management system, so if you want to change one, you need to change BOTH. This is where an open source LMS, such as Moodle or Totara, can be a great choice, because with this comes a multitude of providers who can work with and further develop the system. The move to a new LMS provider should be quite seamless. Ideally, at the end of your internal consultation and needs analysis process, you will have come up with an LMS checklist, with features and requirements that you can then tick off as you talk with a shortlist of elearning companies. Make sure that all of your current, future and possible needs are able to be met by your choice of both learning management system and provider. Elearning helps to make new employee training well-defined and repeatable which ensures that all employees receive the same amount of training. Another great thing about most modern learning management systems is that they can be made available in multiple languages which means that international companies can provide same learning materials to employees in different countries. What is more, with online based learning it is easy to update existing and add new learning materials to meet the needs of the business. This helps to provide new employees with the most recent training materials. To engage with your learners and to make sure everyone is achieving their targets, you can easily track the progress and provide feedback when using online learning management platforms. A lot of onboarding materials are expected to consist of things that your employees will need to come back to again in the future as well as they will need to undertake new training depending on the needs of the business. With LMS based training your new employees can continue learning by using the online environment they are already familiar with. Online learning management platforms can be updated easily, therefore, it is a great way for supporting continuous training within the business. Personalized training plans are great for ensuring everyone is receiving the training they need. This is especially important when talking about new employees because it can be very useful in terms of helping them integrate into the company’s culture as quickly as possible. Providing a personalized learning for new employees can help make them feel more engaged and motivated as they are not overwhelmed with too much information that might not be relevant to their role. Another very important aspect when considering elearning for training new employees is trying to make it appealing to millennials. Millennials are the first generation of digital natives, they were born and they grew up during the age of technological changes and they also expect modern technologies to be an integral part of training in their workplace. Therefore, providing technology based training from their first working days is definitely expected to engage with the millennials generation. Regardless of the type of your business, the main goal behind training new employees is to provide them with the basic information they need in order to start working and to be successful. It includes company’s procedures, legal restrictions, organizational chart, other general guidelines they will need to follow as well as more specific training required for the individual role. Although an effective new employee training program will also need some physical presence, elearning is a great solution for providing flexible, consistent and modern training for new hires. In today’s highly competitive business market, how to train staff to a high-level quickly and effectively, has become a key topic of discussion. One of the most cost-effective ways of training staff is through e-learning. Not only can e-learning save you money in terms of actual training costs, but if implemented effectively, it can contribute to a measurable growth in sales. Effective learning management systems can provide delivery of course materials, analytics on the outcome of any assignments, and even report on specific course attendance. With high staff turnover being an increasing issue for many companies, offering continuous training opportunities can help to minimise this turnover. Training helps provide staff with transferrable skills and can act as an incentive for team members to stay with the company. From supporting classrooms, to acting as a platform for entirely online business training, learning management systems are designed to be used far and wide. However, finding the best learning management systems for your company can be a laborious task, which is why here at Webanywhere, we’ve explored the best LMS of 2018. Totara Learn is an open-source, scalable and configurable LMS. Designed specifically for the needs of a modern fast-paced corporate environment, this leaning management system is a powerful device, enabling you to facilitate and manage the online training for all aspects of your business. Totara is currently used by an array of organisations, from blue chip companies to new-starters, it’s currently used by over 120 institutions. Trusted by many, some of the current users of Totara learning management system include EasyJet, Tesco and BMI Healthcare. Totara LMS gives you total flexibility. No software installation is required, making it the ideal learning management system for today’s busy lifestyle. Anyone anywhere can access Totara through their web browser, making it simple and intuitive to use. With no software installation, your business doesn’t have to waste company hours waiting for the software to install, nor does it waste resources using IT staff. With advanced reporting and analytics, Totara allows you to set flexible appraisals, learning plans, and even self-service course booking. On top of this, learning plans can be completely individualised, whether it be self-led or manager-led, Totara offers complete flexibility in managing development, ongoing performance and the setting of longer-term career goals. This flexibility is key to a successful learning management system. As well as monitoring team achievements and being able to set individualised goals, Totara also allows you to manage your classroom as a whole. Classroom management allows you to take registers and even allows your learners to seek management approval for certain tasks. It is also possible to manage how training is assigned to your staff. New starters can be automatically pre-assigned training when they log in, and even cascaded through their training, meaning as soon as they finish level one training, they’re automatically given access to level two. By providing such a tailorable e-learning platform, companies can see tangible results from their investment in Totara learning management system. With the ability to track the online attendance of courses, through to automatic reminders for appraisals, Totara can take your business to the next level, providing you with a truly flexible and advanced e-learning system. Choosing the right LMS for your organization can be a bit of a nightmare as there are so many out there. On top of that, deciding between an open source or proprietary platform can be really confusing. What does open source even mean? Because we look at LMSs with the end-user in mind, we tend to favor open source – especially for corporate learning. Here’s why. We believe that, where a great solution exists for end-users, open source technology choices are in the best interests of the buyer. Open source platforms benefit from a worldwide community of passionate developers, not just the changeable talent that works for one commercial organization. The ability to tailor the platform to meet your precise needs means that open source platforms are flexible and scalable. Learning requirements are never static, which means neither is your LMS. You’re not tied in to any one provider. When your customer experience starts to go downhill, it’s easy to change providers. An open source LMS usually works out more cost-effective because there are no per-user licence fees. If your workforce is growing, imagine the significant savings. Security / Stability – Vulnerability to attack is a commonly spread myth by people selling a proprietary solution. A widely used platform may be a target for hackers, but with an open source learning platform, there is an army of developers upgrading the system and providing regular upgrades, plugins and patches. If an issue or potential issue with a platform crops up, then wouldn’t you want the combined talents of thousands of developers worldwide working to support a quick solution? Vendor lock-in – This is a key consideration when looking to make a future-proof LMS choice. An open source LMS like Moodle, which has been around for over a decade and offers hundreds of accredited providers in addition to the many other professionals to support it, gives you the comfort of knowing that if you wanted a different provider to support you, other options exist. A proprietary LMS solution means that you are locked-in to the provider, as well as the solution. If you want to switch, it could mean a complex migration process, rather than simply allowing a new LMS services provider to pick up and manage your existing platform. People are often naturally opposed to change and new ideas until they get used to them. Implementing a new learning management system in the workplace is no different. However, if you present your learning management system in the right way, you can expect high levels of excitement and engagement from your learners. Here are some ideas for getting your employees excited about using an LMS from the beginning. Concentrate on highlighting the benefits of using an LMS, including its flexibility and accessibility. Your learners should be happy to hear that they will be able to access the learning materials at their own pace instead of attending time-consuming traditional training sessions. Get them excited about improving their skills and mastering new tasks. Modern learners expect their learning materials to be accessible on any device. Having an LMS that only operates on a computer might discourage people from using it and engaging in learning at their own time. Do not forget that mobile learning is one of the biggest trends when talking about elearning! Considering individual learning needs and providing your employees with personalised learning materials might be another great tool for increasing an excitement about using an LMS. Personalised training can make employees feel more appreciated because their personal skills and career goals have been considered. Not to mention that personalised learning is also expected to close the gaps in their skill sets and to improve knowledge retention. Think about different ways to ‘sell’ an LMS to your employees. For instance, you might consider doing a presentation, creating a video or sending out an email to let everyone know about it. If you have an internal marketing team, speak to them about how your LMS could be promoted and communicated with the rest of your employees. Keep promoting your LMS to reinforce your employees to visit it regularly. This is one of the most effective ways to make your learners excited about using an LMS. Rewarding your employees for completing a course might be the thing that engages them into starting the course and into staying motivated throughout it. A great way to reward your employees is gamification. For instance, you can gamify your LMS with levels that learners can go through as they finish a task. If your company is getting a new LMS, start promoting it to your employees few months before the launch and keep promoting it regularly to make sure everyone is engaged with it. You can also use the tips discussed above to update and improve your existing LMS. Infographic: LMS in the Workplace, where are we today? The LMS market is growing year on year, but many organisations still rely on non-technological methods to carry out their training. Still, many are eager to adopt elearning in the near future. According to a survey based on 200 US firms, carried out by employee training software review firm Software Advice, 80% of buyers surveyed are evaluating LMSs for the first time, while 20% are looking for systems that are more efficient and easier to use. In particular, training professionals want LMSs where they can upload and store content (61%), track training progress (37%) and conduct reporting (25%). We’ve summarised the key facts in the infographic below.